Canadian retailer HGreg.com expands in U.S.
A Canadian auto retailer is growing its network of used-vehicle stores in Florida, and expansion to other states could be on the horizon eventually. HGregoire, which has a string of used-car stores and new-vehicle franchised dealerships in Canada, plans to open its fourth and fifth U.S. stores under the HGreg.com brand this summer or early fall. The new locations are in North Miami, a store that will carry 600 vehicles, and in Orlando, a store that will sit on 15.5 acres near Orlando International Airport and eventually could carry 2,000 vehicles. "Orlando is our largest store yet," John Hairabedian, president of family-operated HGreg.com in the U.S. and HGregoire in Quebec, told Automotive News. "We believe it will be our most successful yet." HGreg.com's first U.S. store opened in Doral in 2010. It later added a location in West Park and opened HGreg Lux, a boutique store specializing in luxury-brand used vehicles, in 2016 in Pompano Beach. HGreg declined to reveal U.S. sales figures, but Dominion Cross-Sell, a unit of Dominion Dealer Solutions that tracks store sales, estimates the three stores sold 4,186 vehicles through the first half of 2018 and 5,420 vehicles for all of 2017. The Doral store is the highest-volume location. Dominion Cross-Sell estimates it contributed three-quarters of sales this year through June. Modern Technologies, another data-tracking firm, reports that HGreg.com had the second-highest independent used-vehicle market share in Miami-Dade County for the first six months of 2018, just behind Off Lease Only and ahead of CarMax Inc. In Canada, HGregoire sold 30,000 new and used vehicles last year. For HGregoire, the sales volume delivers on the promise Florida held when the company began planning its expansion to the U.S. in the midst of the Great Recession. "The [U.S.] dollar was at par with Canada," said Hairabedian, son of Greg Hairabedian, who founded HGregoire 25 years ago. "We figured it would never happen again in history." Florida is the third-largest used-car market in the U.S., according to Edmunds. The HGregoire brand was well-known by Canadians in Quebec — including some who flocked to the Sunshine State for the winter, John Hairabedian said. Internal studies also indicated South Florida was a strong market. "We really figured it would give us enough push to do great," Hairabedian said. If HGreg could be successful in Florida, the thinking was, it could be successful elsewhere in the U.S., Hairabedian said. Expansion is not imminent — HGreg.com plans to complete growth in Florida before it pursues other states. Its next step would be to enter Georgia, Hairabedian said. Growth would come from opening its own stores vs. acquiring others, he said. The Florida expansion has attracted acquisition overtures from other auto retailers, Hairabedian said, but HGreg.com has rebuffed buyout attempts. HGreg positions itself as an atypical car retailer. Its approach includes noncommissioned sales staff,no-haggle pricing, large inventory and expanded hours, seven days a week. It offers home delivery through HGreg Direct. An unusual feature is an air-conditioned warehouse of vehicles that shoppers can visit to peruse choices. The Doral store has an off-site location with more than 1,100 vehicles, while the Orlando dealership will combine a store and warehouse on one property, Hairabedian said. More warehouses may be needed as buying increasingly goes online, he said. HGreg.com offers a seven-day exchange policy in the U.S.vs. a 30-day policy in Canada, where it also has a three-day money-back offer. 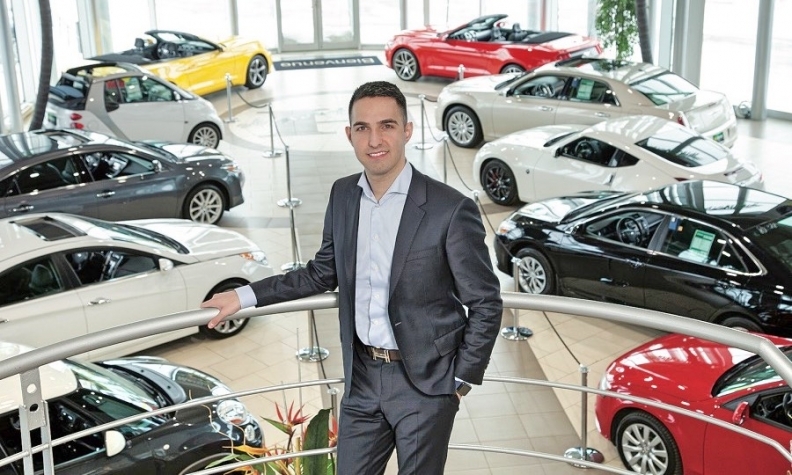 The company started in used cars in Canada but expanded into new-car dealerships in 2014 and now has eight such stores in Quebec selling Nissan, Infiniti, Chrysler, Jeep, Dodge, Ram, Mitsubishi and Hyundai brands. HGregoire would consider opening new-vehicle dealerships in the U.S., though it's not actively pursuing that, Hairabedian said. "If we find the right opportunity with the right OEM partner, we'll definitely do it," he said. "It has to fit the markets we want to be in."